"The Doctor of the future will give no medicine, but will interest his patients in the care of the human frame, diet and the cause and prevention of disease"
Dr. Keith Miniaci has been serving East Haven and the surrounding communities for over 30 years! 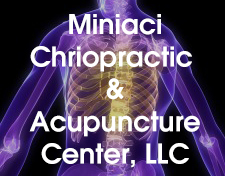 Dr. Miniaci and his professional team at Miniaci Chiropractic & Acupuncture Center, LLC are committed to providing Chiropractic & Acupuncture treatment to address your unique health needs. Whether you are experiencing back pain, neck pain, headaches or migraines or even muscular tightness and tension, Dr. Miniaci believes in promoting the "Whole Body" approach when treating his patients. This means looking for the underlying causes of disease, discomfort and pain, as opposed to just treating the symptoms. Dr. Miniaci will be able to determine the root of the issue and create a personalized Chiropractic/Acupuncture wellness plan to suit each patient's individualized needs. By combining his expertise with hands on techniques, state of the art physiotherapy procedures, offering acupuncture, massage therapy, nutritional counseling, detox, weight loss and exercise programs; our office is able to help you on your journey to better health holistically. You may be searching for pain relief after a motor vehicle accident, experiencing a work-related injury, slip and fall, sports related injury or suffer from a specific condition like chronic back pain or a spinal condition. If you are looking to improve your overall health, Dr. Keith Miniaci and his staff can help you attain your everyday wellness goals! If you have not been to a Chiropractor/Acupuncturist before and want to find out more, please email us or call (203) 469-5210 to receive the answers to your questions from our experienced team.